I was shooting stills of the cycletrack when I heard the sound of an accelerating van and a cyclist’s freewheel behind me. The van had sped up to beat the cyclist to the corner. The light was green for both the road and the cycletrack. 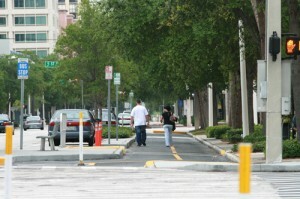 Last week, John Allen and I shot video on the Pinellas Trail extension into downtown St. Petersburg. We made several trips in both directions. We experienced numerous right hook conflicts while traveling inbound with the flow of traffic. We also used the adjacent road and the paired one-way street in the opposite direction to compare time and ease of travel. I will do a follow-up post with a link to John’s blog when he posts his analysis and edited video of this facility. Below are my observations of the facility and the larger cultural problem that created it, and that it in turn reinforces. There is no such thing as a barrier-separated facility. The proponents of these things conveniently forget about intersections. Even a trail on its own right-of-way must cross streets. An urban cycletrack (the new, flashy term for sidepath—a long-ago discredited facility type) must cross streets and driveways every few feet. The conflicts created by this type of facility place a burden on all road users. The green light is for the cycletrack but cars on the street can still turn right across the cyclists' path. 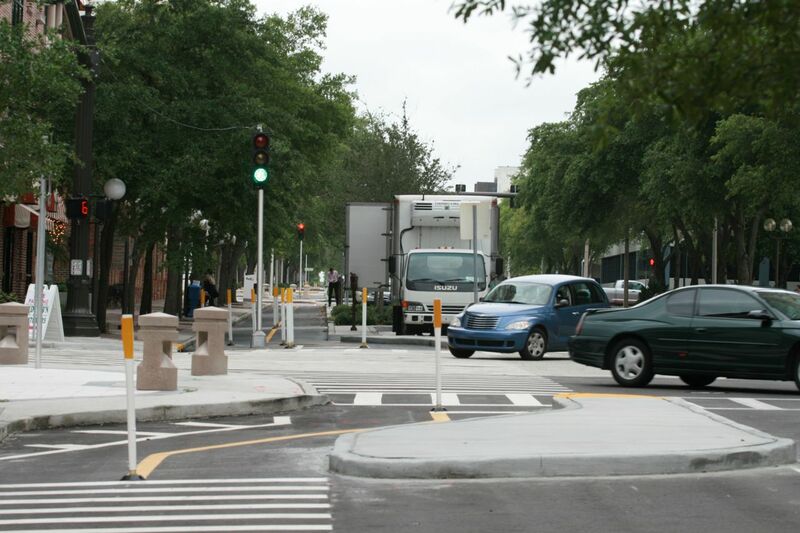 The box truck obscures the view of the cycletrack for right-turning drivers. It also obscures cyclists' view of the road. Outbound on the cycletrack, I rarely got a green light. Despite the numerous crossing conflicts on this course, the prospect of stopping at nearly every block for a red light tempted us to make a run for stale green lights. This increased our risk of getting hit as we focused on the light and not the traffic preparing to turn. In one case, we were charging for the intersection when a pick-up truck turned into our path, then stopped short. The driver, realizing his error, waved us through. After those seconds of hesitation, John was able to make the yellow light but I was farther back and had to stop at the red. Take note that accelerating for a green light is not hazardous when you are claiming a traffic lane because turning traffic is kept behind you. Most cyclists treat the red lights as yield signs. A tight grid and short blocks makes for an abundance of traffic lights. As previously noted, it is especially frustrating to get a red light at every intersection. Of all the trips on the cycletrack, I think we got two green lights, at most. Using the road, we got 2 red lights, at most. After about 3 trips on the path, I started getting pretty grumpy, though I continued in the interest of helping John get video. Riding on the road was so much faster and less stressful. Red lights didn’t seem to matter to the other cyclists. By and large, they simply treated red lights as yield signs. The path is littered with obstacles. These flex sticks can grab a handlbar and throw a cyclist to the ground. In addition to the crossing conflicts, the cycletrack is rife with mid-block crash hazards. The placement of flex sticks in the middle of the path at every driveway creates numerous opportunities for a solo crash. Flex sticks bend when a vehicle hits them, but they are sturdy enough to whip a bike’s handlebars sideways when caught, sending the cyclist to the pavement and possibly onto the curb, where broken hips and ribs are a serious possibility. The curbs themselves are crash hazards. The track is only 10 feet wide and has chicanes at every intersection. This couple walked casually down the cycletrack for 2 blocks, despite the wide sidewalk to their right. I saw far more pedestrians than cyclists in my travels and many crossed the path without looking. I watched one walk right in front of a cyclist, causing him to swerve to avoid her. The city buses deposit passengers onto an island, where they have to cross the cycletrack to get to the sidewalk. This facility offers nothing in the way of increased access for cyclists. 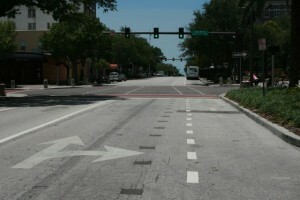 St Petersburg has a tight grid alternating wide streets with lots of lanes and 2-lane streets with 15mph speed limits. A cyclist traveling westbound can use a street one block over from 1st Ave. A cyclist traveling eastbound will face far fewer hazards and conflicts and have the ability to travel faster using the road itself. The cycletrack is nothing more than an attractive nuisance facility. What the cycletrack does best is reinforce the belief that cyclists don’t belong on the road. Sidewalk riding in St. Pete is epidemic to the point of being really annoying. The city has a lot of nice restaurants with pleasant sidewalk seating. People ride bikes right through the tables, despite the adjacent streets having 15mph speed limits! 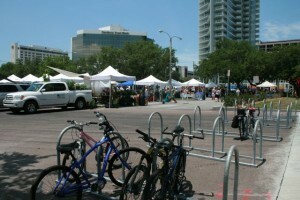 Lots of bike racks at the Saturday Market. 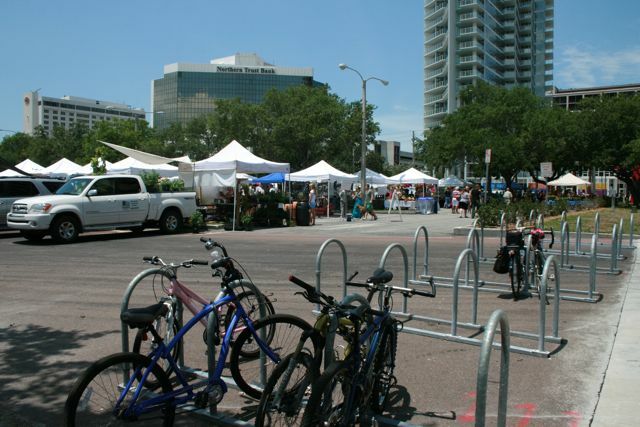 The City of St Pete has done wonderful things in recent years to make its downtown more livable. They are deserving of much praise for their efforts to increase walkability and pedestrian safety. 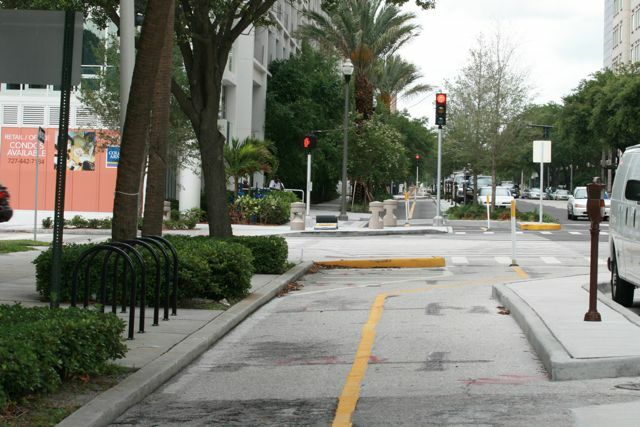 Through a combination of infrastructure, public awareness and enforcement, this city managed to increase motorist compliance at crosswalks from a dismal 2% to an impressive 85%. The sidewalks and parks were teeming with pedestrians in the evenings and on the weekend. I found it to be a very appealing, human environment. The city has invested a lot in its commons — created dog parks, skate parks and other pleasant public spaces. 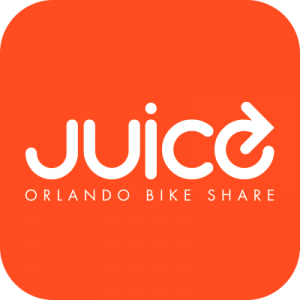 There are lots of bike racks around town, certainly more than I’ve seen in Orlando. This block is the bus depot. 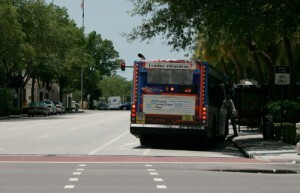 There is constant turnover of buses crossing the bike lane. They are often parked diagonally, blocking it. St. Pete has done a fair amount of bike lane striping in the interest of promoting cycling. Some of it is relatively harmless, other isn’t very well thought out. For example, the bike lane on 1st Ave N runs past the bus depot, so it has a high turnover of buses passing though it and partially blocking it. Since that is a one-way street, the lane could have been put on the left side to avoid that. What does the dashed line mean? It only works if all the players understand how to use it. Better yet, just teach people how easy it is to ride on an urban street and avoid all the potential conflicts. The beauty of a wide urban one-way street is that cyclists can choose to ride on the right or the left, depending on their destination. Placing a bike lane on one side creates the impression that cyclists must only ride there, causing them to have to merge across 3 lanes of traffic to make a turn on the other side of the street. Uninformed cyclists have no idea how to outsmart the paint where it puts them in the wrong place. Informed cyclists don’t need or want bike lanes on roads like that. So the best solution is to focus on educating cyclists and providing low-volume alternatives. 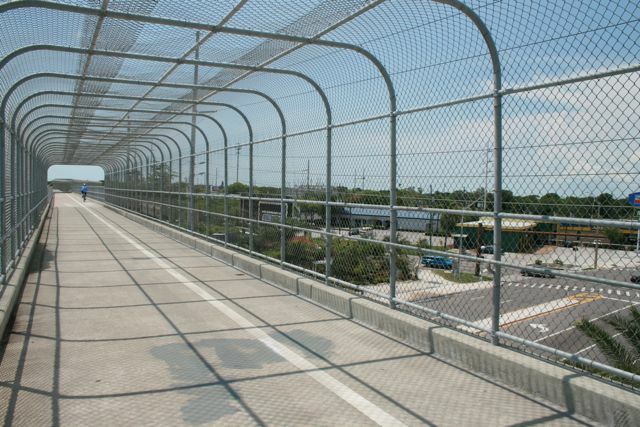 With the excellent grid street system St. Pete has, it could easily create bike routes on minor roads (like Dallas has done) and leave the thoroughfares alone. 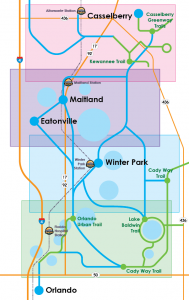 The Pinellas Trail runs through suburban and commercial corridors of St. Pete, Clearwater, Seminole, Largo, Dunedin and Tarpon Springs. Between St. Pete and Seminole, spectacular skyways span several hundred yards over arterial roads and busy commercial areas. 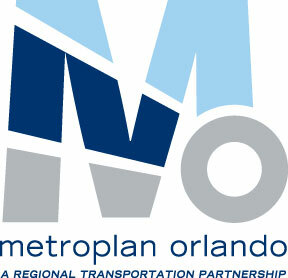 It is a useful facility with good connectivity to neighborhoods and few major intersections. 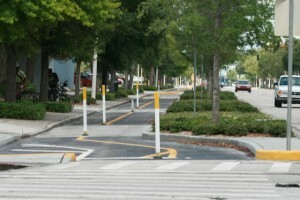 The bike lane issue is relatively minor compared to the cycletrack boondoggle. The trail extension cost $6 million—for 10 blocks on one road. It is a glaring example of wrong-headed policy-making—the stubborn insistence that the rail trail (which works extremely well in the suburbs) must be continued into the urban core as a separated facility. The myopic focus on achieving the impractical, blinded its proponents to good integrated solutions and resulted in a tedious, conflict-ridden obstacle course. It’s a tragic terminus to an otherwise-outstanding trail. 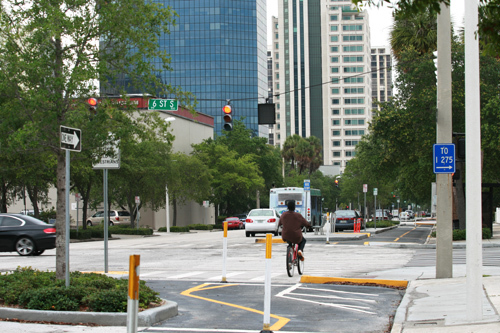 St Petersburg’s street system lends itself to excellent low-tech, low cost solutions for bringing bicyclists into the urban center. From what I’ve seen, bike boulevards would work well here. The urban center itself has a number of 15mph streets on which the average cyclist can ride the speed of cars. The larger, 30mph, one-way streets are comfortable and easy to ride at slow speed as well. If they spent that kind of money on public awareness, education, bike boulevards, sharrows, cyclist-friendly signal-timing and a wayfinding system, they could create a world-class cycling city. They’d make life better for cyclists citywide AND counter the mode-share-killing superstition that cyclists need to be separated from motor traffic. Cycling in a downtown is amazingly EASY. It’s easier than driving a car! If you want to promote cycling, teach people how safe and easy it is. Creating limiting, conflict-ridden facilities that coddle and reinforce their belief that it’s difficult and dangerous just makes no sense! Why is this concept so hard for some bike advocates to understand? It’s time for cyclists and cycling advocates to open their eyes and see that the pomp has no substance. See it and say it. Insist on real solutions that expand access to the whole transportation grid and make cyclists welcome on every street. 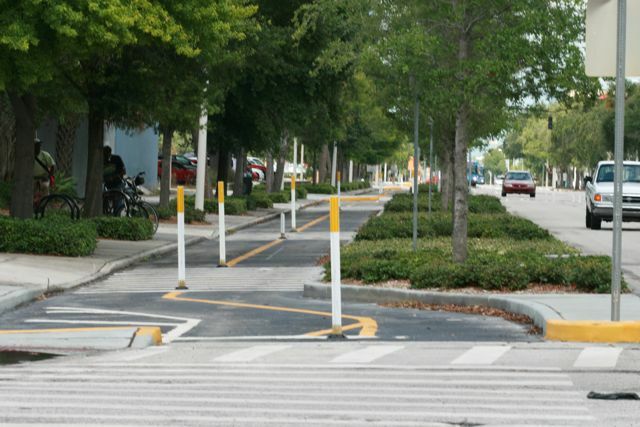 It’s time to stop rewarding symbolic bike facilities and counting miles of paint stripes. The less flashy solutions are almost always better for cyclists than the ones applauded by “bike advocates.” We can do 1000 good things for cyclists for the cost of a few miles of showpiece infrastructure. There are good solutions which welcome cyclists on all roads and move us in the right direction—toward a culture where bicycling is a normal, accepted and respected part of the traffic mix. I’m not sure the term “cycle track” is appropriate here. In my understanding a cycle track is a barrier separated bike lane; uni-directional and separate from the sidewalk. This is separate from the sidewalk, but I wonder about the intended users. Since it’s “The Pinellas Trail” there may be an expectation that this is a shared use path, like the rest of the trail (even though there are sidewalks right next to it). In the sidepath stretch of the facility one would probably be correct in calling it a “bike path.” One of the few cases where the term makes sense. Well said! For true connectivity, it should be thought of as a route. 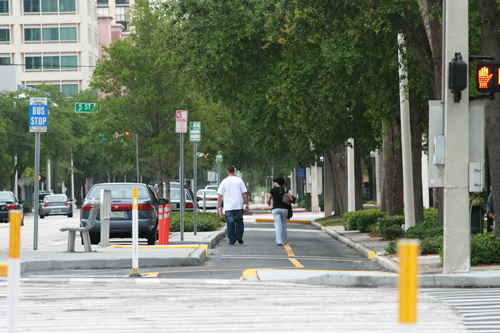 The paths of pedestrians and cyclists may need to diverge onto different facilities when the separate right-of-way ends, or the area becomes too dense with road crossing. At that point, pedestrians need sidewalk/separated infrastructure and cyclists fare better on the streets. The need to make the trail itself continue almost always results in some hideous Frankenstein’s monster or shared sidewalk facility. As soon as the trail curves East/West, it begins to cross streets with constant stops. Even before it reaches the downtown, it’s tedious. They have at least installed various crossing signals to stop traffic (though 2 of the HAWK beacons are installed backwards), but most cyclists I saw didn’t stop or push the button, they just took their chances. When I see infrastructure like that, all I see is $$$$. I know planners and others generally have good intentions, but it bums me out to see lots of money wasted in the name of “cyclists”. That kind of cash to do so much to educate so many instead. That was exactly my feeling about it! Watching the cyclists in St Pete really bummed me out. So much wrong-way riding, sidewalk riding, red light running. The club riders had the best road skills, but they were in their own private Idahoe when it came to traffic control devices (this is a major point of contention with motorists and is seen in letters to the editor there). One woman was lucky I saw her as I stopped at a 4-way stop sign or we would have had a bike-v-bike collision. She totally violated my right-of-way, blowing through at speed. I have a different concern about these cycletrack/sidepaths ….. it seems to me that these devices decrease situational awareness. You have pedestrians stepping into these paths because they know there will be no conflicts with cars, so they can walk in any direction, head down, listening to iPods. You have cyclists who let their guard down because they are on paths designated for them, not aware of increased potentials for crashes into objects or pedestrians, and increased risk at intersections. If they were stepping into streets, I think there would be more pedestians looking both ways. Likewise, cyclists would be more aware since they are expected to act like vehicles but are more vulnerable when traffic mistakes are made …. Do we know if we have any crash statistics on these new cyclepaths to see if what we perceive is actually being born out in hard numbers? I don’t know of any recent studies. When these things were tried in the 70’s they were studied and found unacceptable. But it’s the new millennium in America, and there’s a noisy contingent of egg-headed academicians who have determined we must coddle people with the illusion of safety to convince them to ride bikes. Cyclists fare best when the act and are treated as drivers of vehicles. Coddling people who don’t wanna, just to convince them to ride bikes, is bad public policy. Coddling them with an illusion of safety and increased risk is unethical. It also takes energy and resources away from solving broader traffic safety and infrastructure issues that affect bicyclists and pedestrians. Ask the man that owns one. Links to the last two are on one of the pages I provided links for. When I see infrastructure like that, I see cycling taxes and mandatory use of the infrastructure I didn’t want. In North Texas, we have infrastructure that pretty much FUNCTIONS like that, but we call them “Freeway Service Roads” and we tell the motorists that they’re for THEIR benefit!